It was a beautiful morning - again. We met on the patio for breakfast. The whipped hot chocolate was marvelous. We had a leisurely breakfast, watching the birds flit back and forth over the pool and into the bougainvilla that climbed up the ramada supports. After we finished eating, we gathered our supplies for the day, including water bottles, and walked down the road to the entrance of the Zona Arqueologica. After buying our tickets, we again entered through the arching branches of the low trees. Now we could see the area that we made our way through last night. It was a long entrance path over rough ground with many exposed roots. 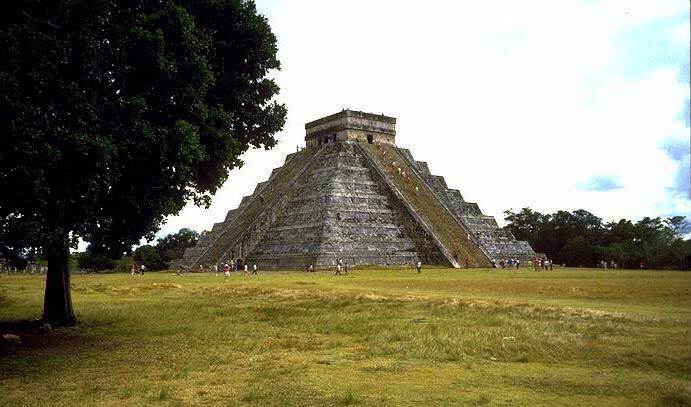 Then we broke out into the open area, the Central Plaza, and we were standing behind El Castillo, the great pyramid, the Temple of Kukulcán, from which he descends at the spring equinox. The famous image was now alive before us. It was almost impossible to look away! As opposed to Uxmal, which is almost intimate, Chichén Itzá is open and expansive. 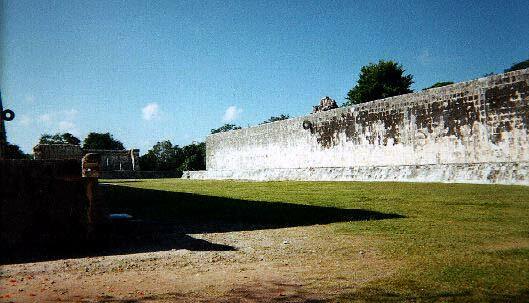 And you need the space to take in El Castillo. We walked slowly around to the front, that is, the fully restored side. 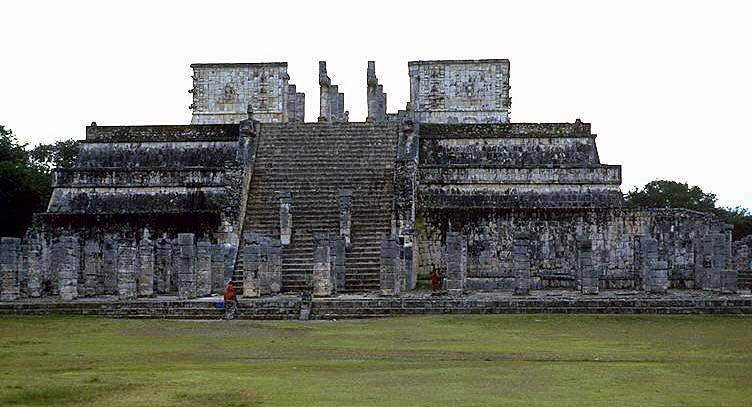 Only 2 of the original 4 staircases to the temple on the top of the pyramid have been restored. Suzan and Ryan, accompanied by Steve, began the ascent. I begged off. I climbed to the top of Teotihuacan 13 years ago with no difficulty. Only a couple of years ago I was on my way up again with some friends when one of them suffered an attack of panic, so I stayed with her. While the others continued to the top, we slowly made our way down to ground level. But over the past couple of years I have noticed that the proper functioning of my knees disappears rapidly as the steepness of the climb increases. I had no difficulty hiking in the Tetons last summer or making the trip out (and up) to Delicate Arch, but the sides of El Castillo rise at an angle of 45°, far to steep for me to feel comfortable climbing and for a walking stick to be of much help. Besides, I enjoy being alone to absorb the "spirits" of the people who lived here and created these incredible structures. While they climbed, I first viewed the pyramid from a variety of angles, absorbing the presence of the central force of the culture. Then I moved to the left side where a few small structures could be examined in detail. These were the House of the Tigers and Eagles and the Tzompantli. The House (or Platform) of the Tigers and Eagles is one of the smallest structures, possibly used as a dance platform. The decorative motifs on the walls of the platform are Jaguars and Eagles holding human hearts in their claws. 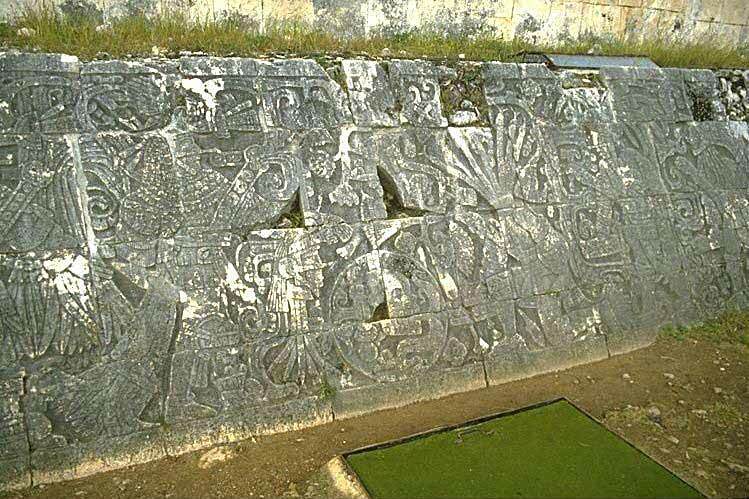 These reliefs are quite similar to those found at Tula, north of Mexico City and are symbolic of the military orders of the Nahua Indians, the Eagle and Jaguar Knights. 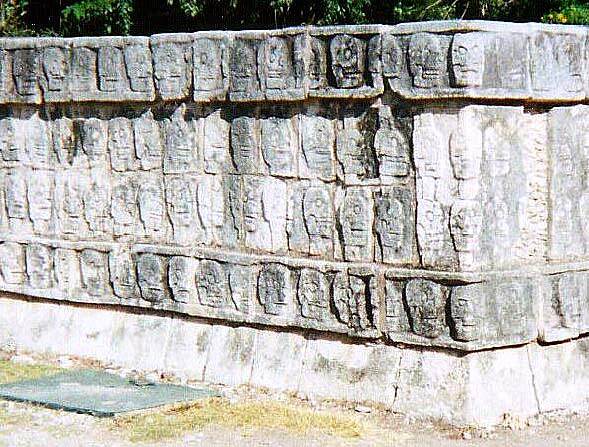 The Tzompantli, or Platform of Skulls, is a much larger structure. Its most striking characteristic is the relief sculpture of rows of skewered skulls, all different, each with its own personality, which surrounds the entire platform. Along the sides the skulls are in profile; on the corners they are full face. This structure is supposed to have supported a rack upon which skulls of those people sacrificed were displayed. Nearby was the Temple of the Jaguars. 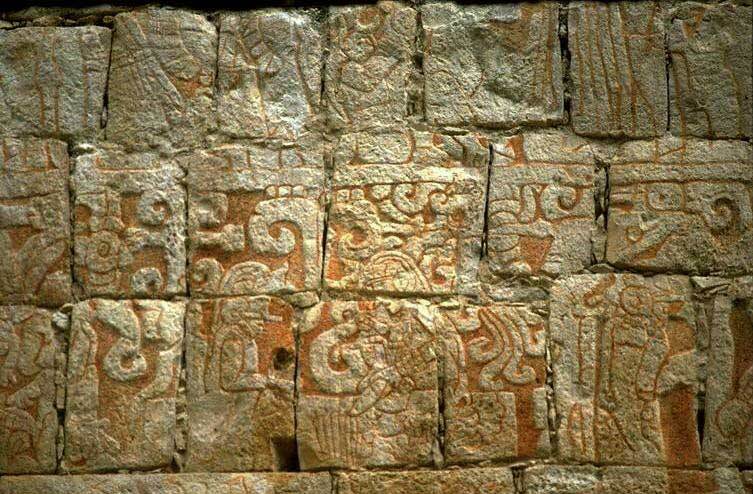 Within the temple are murals supposed to depict a battle between the Mayas and the Toltecs. The murals are very poorly lit, at least at this time of year, but I stood and listened to a guide deliver his speech in Spanish just to hear the rhythm of his voice and try to imagine this world at another time. I wandered back to look at the eagles, jaguars and skulls again as Steve, Suzan and Ryan were coming down the staircase on El Castillo. After they had examined the relief sculptures on the platforms, we wandered over to the Temple of the Jaguars. There was no private lecture being delivered now so we could get a little closer to the mural, but the light was very poor and it was difficult to make out the battle scene. Then we descended into the ballcourt, the largest that has been found in MesoAmerica. The large grassy court (85m [280 feet] × 35m [115 feet] ) was bounded by two high walls. On the walls, midway down the court, are high (7m [22 feet]) stone rings through which the players were supposed to send a hard rubber ball., using only their knees, elbows and hips. Since the ball was a symbol of the sun, it was not allowed to touch the ground. To do so would be to interrupt the symbolic course of the sun across the sky. The losing players were sacrificed. Relief panels along the walls show these players being led to the sacrifice. 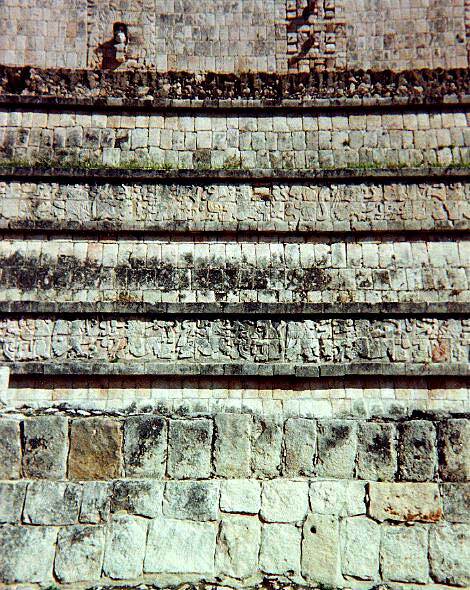 While Steve and I walked down the walls from one end of the field to the other, finding more relief carvings at the end of the ballcourt, Suzan and Ryan climbed to the top of the wall by a staircase on the Temple of the Jaguars. They appeared suddenly standing atop the wall above us. While they lorded it over the field, we walked down to the far end of the ball court and back through the trees that would soon cover the site again, were they not constantly held back by the maintainence crews. Now we walked along the North side of El Castillo. 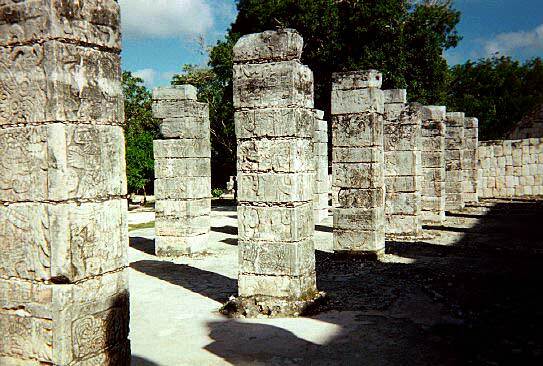 While Suzan and Ryan went off to find the path to the Sacred Cenote, where sacrifices were made in times of drought, Steve and I examined the Venus Platform, similar to but slightly larger than the House of the Eagles and Tigers, and then went on to the Temple of the Warriors. Here was another stairclimbing exercise to get to the temple and to see the Chacmool, altar and other sculpture closeup. Again I declined to climb the stairs, so while Steve went up, I explored the Group of A Thousand Columns. 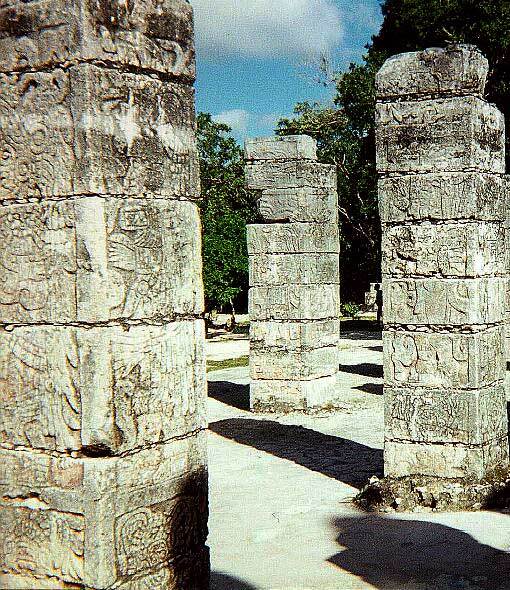 Columns were an an architectural device not known to the Mayans, until contact with the Toltecs. 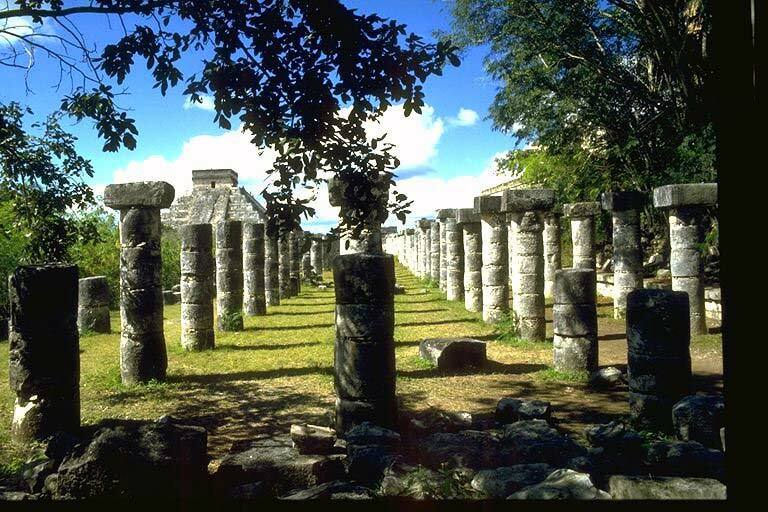 There are no columns used in the pure Puuc architechure found at Uxmal. That is one of the things, besides its smaller size, that gives Uxmal its intimate atmosphere. The rooms are all separated by closed walls. Here columns are used to support ceilings and roofs, allowing more open areas within the buildings. It is not known what purpose the Group of A Thousand Columns served. It was presumably roofed over originally. The columns are all covered with relief sculptures of figures of warriors. The fact that they are no longer roofed over allowed me to get a good photograph of the well illuminated wall of the Temple of the Warriors, with its 2 relief panels of figures and stacked Chac masks at the top. Steve came down from his trip up the stairs to the temple and the Chacmool. I gave him a tour through the columns, examining the warriors, and then we retired to the shade under the trees to wait for Suzan and Ryan. It had been a long, sunny excursion (it was nearly 2 o'clock). When they returned, we decided to go back to the hotel for a swim and lunch. After a swim, we had lunch at a respectable time for Mexico, about 3 PM. Then we lounged on the patio in the shade for a while. Later we took a walk in the neighborhood and around the grounds, among the trees. When it got dark, there were fireworks from near the town. When it was really dark, we took my field glasses out and looked at the planets and the Pleiades through them. The sky was so dark that the plane of the galaxy appeared to leap out of the sky. We were tired from our explorations of Chichén Itzá. 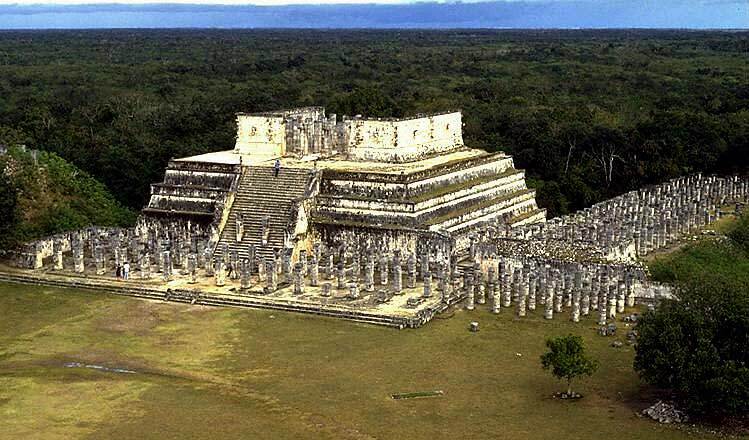 We retired early so that we would have plenty of energy to explore the south part of Chichén Itzá in the morning.